Demon Hunter V: Ascendance contains explicit content and is intended for mature audiences. When Hector, Demon Hunter for hire, agreed to save a lost tourist from the haunted Museum of Mysticism and Monstrosity, he never imagined that it could all be a clever hoax staged just for him. Hector will need all his cleverness and intuition to find the truth in this double mystery. Are demons real or was it all about the money? 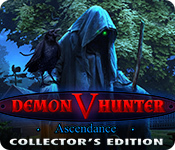 Find out by playing Demon Hunter V: Ascendance! Demon Hunter V: Ascendance Collector's Edition is rated 3.4 out of 5 by 19. Rated 5 out of 5 by Maniactree from So Much Fun!!! I absolutely loved this game. It was so much fun! The story line was great, and I wanted to keep playing to get the answers I needed. I loved the main characters, Strange and his wife. Talk about freaky looking people - brilliant! There was a nice mix of HOs and puzzles, and you didn't have to do unnecessary running around. Yes, the Demon Hunter did get excitable at times, but that just made me burst into laughter. You have to have a sense of humour about these things. I found myself laughing throughout this game, and I left the volume on because I loved the background music. I wish there were more games like this one. It was great fun all around! Rated 5 out of 5 by rosieobop from A cut above the rest... I was surprised how much I really loved the total experience of this game. Morphing items are something I totally get into and enjoyed here. The HOPs and challenges were varied and engaging. The background music didn't cause me to mute and the graphics were of a high standard. I like to be a bit scared and this provided a wee chill factor. Thanks to the game creators. Rated 5 out of 5 by odarney from Great & Different This review is based only on the demo. Love the storyline - and I didn't see it coming. I also enjoy the fact that the main character is tough and not scared....yet. The house is dang creepy and the level of anticipation was exciting, better than most games/stories; different/better. This is a definite recommend. Rated 5 out of 5 by hopqueen from Creepy Yet Humorous! This is such a fun game! It's definitely in the vibe of Halloween, but I like creepy games all year round. There are some jump scares, so I guess that's why it says there is "explicit content", but just to be clear, there's nothing offensive that I came across in the demo, just jump scares. We have three collectibles to look for: 1. Morphing scrolls in all scenes. These morph slow and are tough to catch. 2. Crystals in all scenes. These don't morph and are medium toughness. 3. Morphs in some HOPs, and they're not too easy either. The first one in the first HOP is actually an item you need! I really like when there are a number of collectibles, not just one or two, so this is right up my alley. The character has a good sense of humor, but I did mark the sound quality down a little in my rating because his voice isn't balanced with the music and background in general. It's too quiet, which is a problem with the production, not the voice talent. The atmosphere of the game is dark and creepy and sometimes grotesque in a horror movie kind of way. If you aren't into that, this game isn't for you. I really enjoyed the demo and found the general level of challenge to be sufficient for someone who plays HOP games all the time (literally every day). I'll be buying this game, and I recommend it! Rated 5 out of 5 by biscuitsmama from ASCENDANCE - A GREAT ADDITION TO THE DEMON HUNTER SERIES Welcome to the Museum of Mysticism and Monstrosity Mr. Cole. In the fifth game of the Demon Hunters series Ascendance you will play the game as Hector Cole a well-known and excellent Demon Hunter. You have been hired by the Director of the Museum Edmund Strange to investigate and above all find a missing tourist who never left the museum at closing time. You are the last hope Hector so get to work and delve into the mystery and find that missing tourist. The Demon Hunters series is one that I have always enjoyed but to be honest as I played the demo I was skeptical that this was a game from the same series as it seemed to be somehow a comical parody but it might have been the corny dialogue. However, as I progressed in the game and got to the point where the demo ended things really heated up and I was hooked. The HOPS are much the same as we always see so there is nothing new but there is a bit of a catch with some of the HOP scenes so you will need to keep your eyes open. Where I had the most fun with the game is the Puzzles that for me were excellent. Although we have seen them before they seemed a bit different and even a tad more difficult. Once the storyline developed it became very good and made sense which often doesn’t seem to be the case with some games. As I moved forward I felt like I was part of the mystery and knew there was more to the story of the missing tourist. Was it all a hoax or is there truly something strange going on at the museum. For me the game became one that I enjoyed playing and it kept me involved as I moved forward. Thanks Brave Giant you created an awesome game with Demon Hunters V. Ascendance is entertaining and held my interest throughout the game. I now hope to see more of this series in the future. As always, please try the demo to see if you will enjoy Ascendance as well. Happy gaming! Rated 5 out of 5 by Ndwelt from Well Done!! A little more on the halloweenish side but not gory or frightening. I liked the way the demon hunter narrated his adventure. After I got used to his voice he even began to be on the funny side. Loved the interaction, the characters, the puzzles and the storyline. Except for a few wrong wordings in the conversations (a pet peeve of mine, that and misspellings) it almost seemed lighthearted. I am considering this a must buy on a great Black Friday sale. Well Done, indeed! Rated 5 out of 5 by sunnyglow from HAVE A DEVILISH GOOD TIME BATTLING A DEMON REVIEW BASED UPON THE ENTIRE GAME 4 Chapters Plus a Bonus Chapter – Strategy Guide: 44 Pages OVERVIEW: As the noted Demon Hunter, Hector Cole, you are off to The Museum of Mysticism and Monstrosity to battle another demon. You have been contacted by Edmund Strange, curator for this museum. A tourist entered the museum but never came out and all efforts to locate him have failed. It appears the museum has been a hotbed of increased paranormal activity. There is a demonic force which has been unleashed by a tragic circumstance. Get ready to battle this demon before it descends upon the entire world. OPINION: This is my favorite series from Brave Giant. The game is long, and I feel the quality of this game is excellent. I did not find the game scary; however, I feel it has a well-written storyline. The pace is excellent with plenty of activities to keep the player engaged. I feel the graphics are greatly improved from past games from this developer. The scenes are cartoonish, but the dark ambiance adds to the flavor of this game. There are only a few minor things which I did not enjoy about this game. In my opinion, some of the dialogue is a little hokey and melodramatic. I also feel that more of the mini-games should have been made available for replay. MECHANICS: There are four (4) levels of play including a customized version. There are twenty-four (24) achievements. Collect twenty-eight (28) morphing scrolls and twenty-eight (28) crystals. Every scene has one of each of the collectibles and all are easy to locate. There are also some morphing objects within the HOP scenes. You can replay eight (8) mini-games and eight (8) HOP scenes. There are eight (8) wallpapers along with concept art, music selections and cutscenes from the game. BONUS CHAPTER: It is a sequel. After solving this case, you are asked for an interview by an up-and-coming journalist. Go back in time to relive a momentous camping trip with your fiancée. Learn the story why Hector Cole entered the field of the paranormal. I found this chapter somewhat weak in comparison to the main game. There are no collectibles within this chapter. There are four (4) HOP scenes and four (4) mini-games. I feel the story is excellent but am not impressed with some of the activities. I also feel that the pace bogs down in some of parts of this chapter. 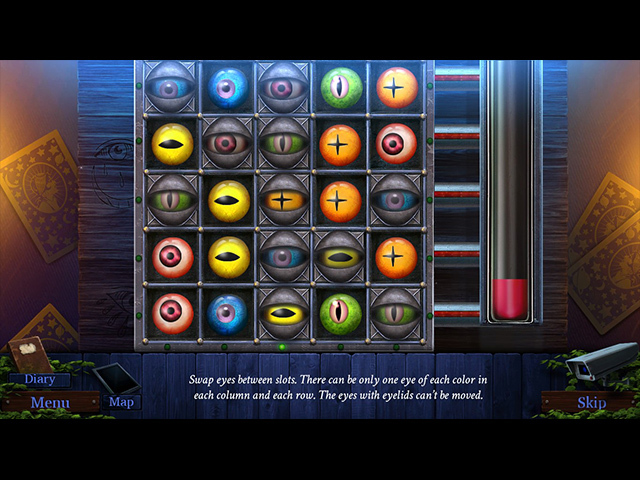 HOP SCENES: There are twenty-one (21) scenes within this game. Most of the scenes are lists of items and silhouette. I feel they are standard fare seen in other games. 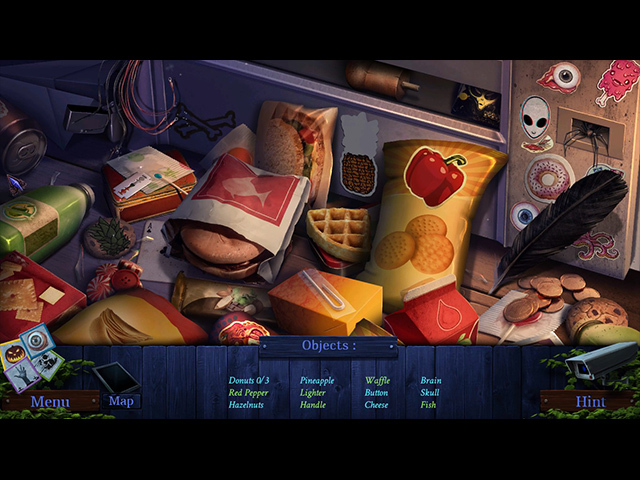 There are some scenes in which the player searches for a small number of one item. There is one FROG. There are morphing objects within some of the scenes. PUZZLES: There are forty (40) puzzles within this game. They are varied in difficulty and style. In my opinion they are the best part of the game. Nevertheless, I am dismayed that Brave Giant only offered eight (8) to replay. I planned to replay some of these, but that would require replaying this entire game. There are three (3) storybook puzzles, which to me are more like HOP scenes than puzzles. In these puzzles, the player must locate three (3) items for each scene within the pages of a book. There are also some activities which are not listed as puzzles but should have been listed as such. There are several instances of searching throughout a scene to get numbers or symbols to open locks or some device. SPOILERS: HERE IS A SAMPLE OF SOME OF THE PUZZLES AFTER THE DEMO: A. Sequence puzzle. Move four (4) levers on a generator up-and-down until all the lights above them turn green. Moving one affects the others. B. Rotating rings puzzle. Rotate three rings with purple and green marbles so that the purple marbles are on the left and green on the right. C. Chess puzzle. Move the knight on a chess board with its “L” shaped moves until all squares on a chessboard are covered. D. Storybook puzzle. Locate silhouette items within the pages of a book (There are three of these within the game). E. Mathematical puzzle. Using two dials which can rotate two spaces counterclockwise and three spaces clockwise, move around a disk with an image upon it to light up parts of the image on the disk. F. Assembly puzzle. Climb up a telephone pole by placing rungs in the proper location on a telephone pole while ascending. G. Balance puzzle. Cross a river by balancing yourself across a log. If you are out of balance you will fall into the river. BONUS CHAPTER: H. Sequence puzzle. On a grid, move your token across a lake while avoiding monsters within your path. I. Mathematical puzzle. Switch fuses until the combination of each pair of fuses equals a number between them. J. Connection puzzle. Connect like tokens with chains without crossing paths. Rated 4 out of 5 by charlene_lane from COME ON HECTOR, SAVE CAROL REVIEW OF COMPLETED GAME AND BONUS This is a terrific game and definitely worth putting in your collection. You once again play Hector Cole who has to save your partner Carol. The bonus is a sequel leading up to what happened. There is: * Casual, Advance, Expert and Custom modes; * Voiceovers (with dialogue); * Interactive map; * 24 Achievements; * Diary; * Find 28 crystals and 28 morphs (main game only); * 8 replayable HOPs and 8 replayable mini-games. The graphics are great. Everywhere is crystal clear to see and to find the items you need. There is a good creepy feeling to the game and an urgency to find out what happened. Sound is good and the music is mainly orchestral. 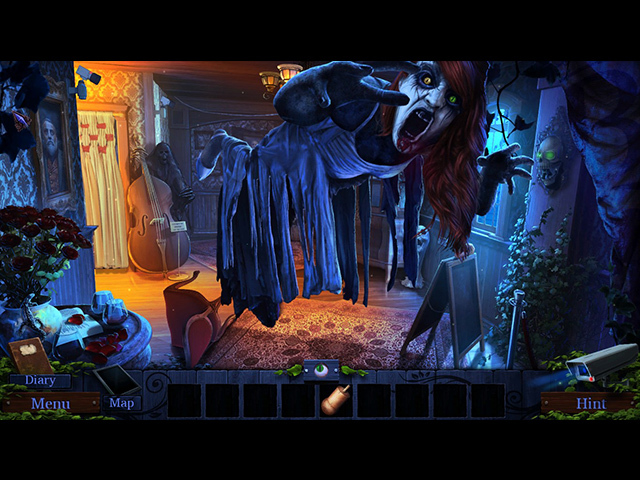 The hidden object games are interactive straightforward, silhouette and find a certain amount of one item (eg: feathers). Items to find are clear to see and they had quite a good challenge to them. However, if you feel like a change, then you can play Shuffle instead. I enjoyed the mini-games. There are a good variety and some really do make you think. However, none of them are too hard or take too long, so you can get back to the game fairly quickly. There are 28 crystals and 28 morphs to find (one crystal and one morph in each scene) in the main game only. These are relatively easy to spot, however I always made sure I did these first in each scene just to make sure I got them. I managed to get 23 achievements. The one I missed out on was doing a mini-game in under a minute, so I'll try and get that one when I play again next time. All up the game and bonus took me about 5 hours playing over the course of the week. I thoroughly enjoyed it too. Overall this game is so worth playing. Thank you Boris and the team - I always look forward to your stories. Happy playing fishies. When Hector, Demon Hunter for hire, agreed to save a lost tourist from the haunted Museum of Mysticism and Monstrosity, he never imagined that he could be the one in need of saving.